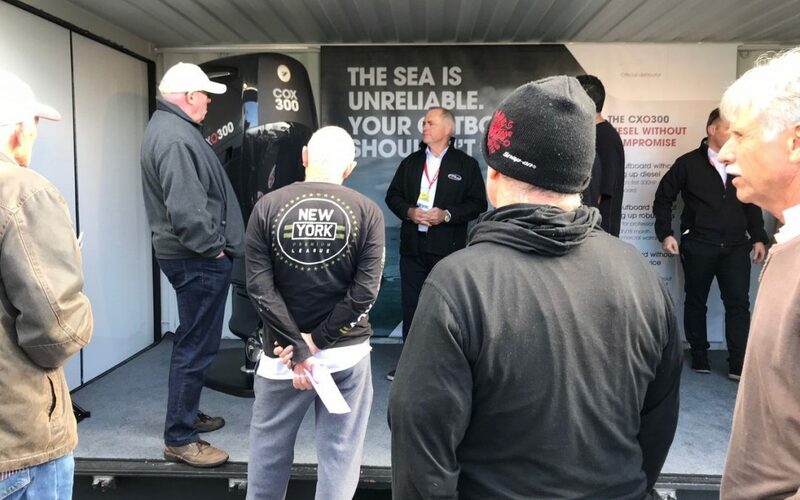 Lancing, 22 May 2018 – The much-anticipated CXO300 diesel outboard engine made a big impact at the Hutchwilco New Zealand Boat Show in Auckland. Cox Powertrain’s distributor for the CXO300 in New Zealand and Fiji, Sports Marine Limited, revealed a model of the 300hp diesel outboard engine on its stand Ex80 at the show. Director for Sports Marine Limited Ian Williamson said: “The reaction to Cox Powertrain’s CXO300 diesel outboard engine was incredible. It was an extremely busy show for us. We had hundreds of people come to talk to us and ask about various specifications of the model. British diesel outboard innovator Cox Powertrain recently appointed Sports Marine Limited as its distributor forNew Zealand and Fiji. Based in Christchurch, New Zealand, Sports Marine Limited has over 40 years‘ experience in outboard motor sales. The company joins an exclusive global alliance of distributors that have been chosen for their reputable standing in maritime engine solutions for both professional and recreational users.